Repair & Restoration. Page 2. 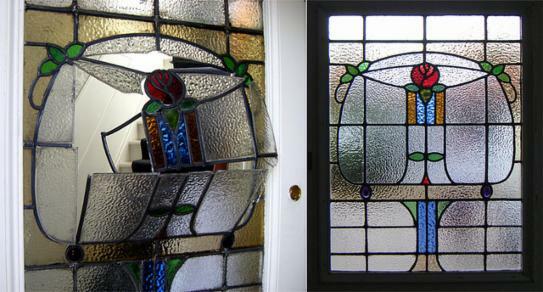 Stained glass repairs if minor can be made in situ. 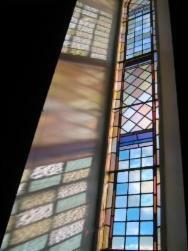 Where the lead holding the glass in place is weak or falling apart then the stained glass panel may have to be removed to the studio to carry out the work required. 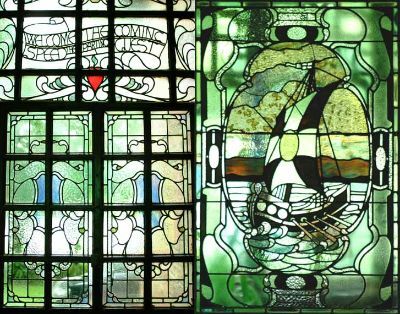 The entrance to this 1900 Mount Vernon home had two stunning stained glass panels to "Welcome the coming, Speed the parting guest". 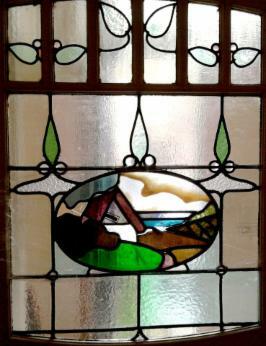 ( Oscar Paterson / Andrew Stoddart 1860's - 1930's). 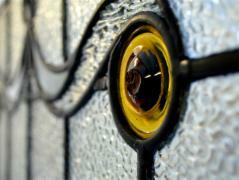 Repairs were made to the outer door and a complete re-leading of the top section of the ship door panel was needed. The ship was made as a single panel and measured approx. 1m X 2m. Behind the ship there is a gold mottled rippled sky. Repairs were made to over 40 square metres of glass and new windows constructed and installed for this Grangemouth church conversion for J.D Wetherspoons. Charing Cross and West Parish Church, in the centre of Grangemouth. Built in 1883 by the Free Church of Scotland, the church was originally named the Zetland Free Church, after its patron, The Earl of Zetland. 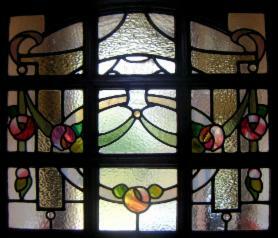 Stained glass repair of upper sash window frame. 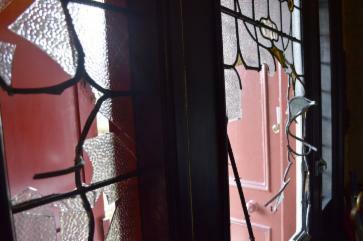 Complete re-lead and replacement for broken sections of glass. Jordanhill, Glasgow. 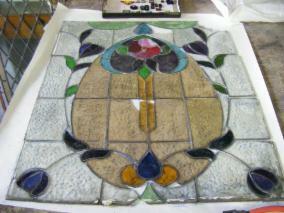 Stained glass window repairs. 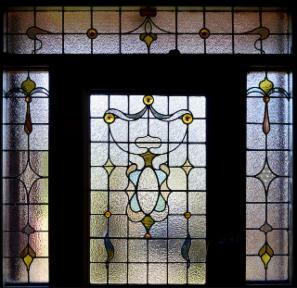 Two arts and crafts styled front door panels. Newlands, Hyndland, Glasgow. Early 20thc. 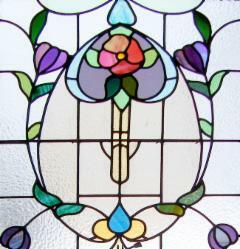 The before and after of a repair to a rose themed front door stained glass window panel in Clarkston, Glasgow. 1930's. Repair and Restoration Page 1, Page 2, Page 3, Page 4, Page 5, Page 6.